On factory floors, compressed air is often perceived as free, therefore, compressed air plumbing design may be somewhat neglected. However, the quality of plumbing designs largely affects the air quality and air pressure losses, causing machine operation instabilities. Here, compressed air distribution plumbing designs will be explained in two parts: Factory floor distribution plumbing basics and plumbing methods of main and branch lines. 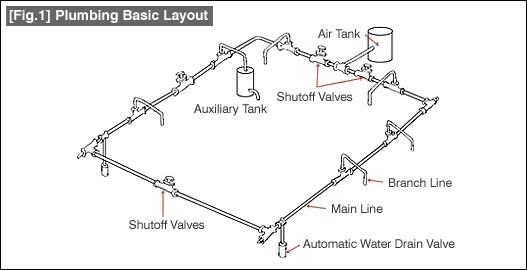 For general factory floor level plumbing, the Loop Method shown in [Fig.1] below is used. 1. Uniform air pressure is supplied throughout the entire factory, even with small diameter tubing. 2. The auxiliary tank assists in maintaining the maximum system pressure during momentary large air consumption periods, avoiding negative effects on surrounding air devices. The air supplied from the compressor becomes likely to contain water condensation due to air expansion. The water condensation and lubrication oil from the compressor are mixed and the resultant emulsified fluid would flow in the distribution pipes with air. This emulsified fluid causes degradations of valves and air cylinders. The key is to design where the emulsions do not enter the branch lines from the main lines (see [Fig.2]). Emulsion entering the air equipment can be prevented by following the below guidelines. 1. Provide mainline incline in the direction of the air flow (Approx. 1cm per 1m incline). 2. Point the branching tees upward. 3. Mount water drain utilities on low points and end points. The compressed air in the distribution plumbing contains rust, mold, and other impurities in addition to the emulsions. Air filters and lubricators should be installed to reduce friction variations and to prevent corrosions of air equipment slide components. Below are the points on the air filter and lubricator connections. 1. Place air filters and lubricators within 5 microns. 2. Separately anchor the air equipment from the branch pipes to isolate unexpected air pressure related to movements of branch lines. 3. For installations where distribution plumbing vibrations are expected, avoid the use of solid steel or copper pipes and use flexible rubber and nylon tubes instead to prevent damages to air equipment. 4. Reduce the number of connections to improve system overall reliability. 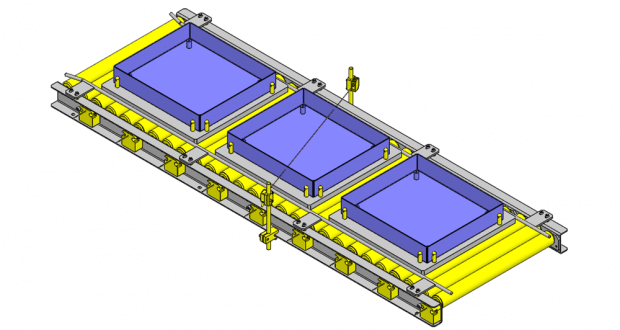 Creating the proper air supply system is key for a successful and safe factory floor. Stay tuned for our next post covering pipe diameter sizing!